Earth Day 2019 is rapidly approaching. This year, you can involve your students in a world-wide race with scientists and zoologists to save one of the most endangered species in the world, the Asian Elephant. The fact-based storybook, The Index Elephant, may be used alone or with inquiry-based activities found in the Unit’s Invisible Threats teacher’s guide. Have you visited BioEd Online’s library section? It contains student storybooks and magazines, classroom worksheets and a media library—plus links to BioEd’s integrated and inquiry-based teacher’s guides and lessons. Check it out today! Have your students explore the physical, life and environmental health science behind the foods that end up on their tables. 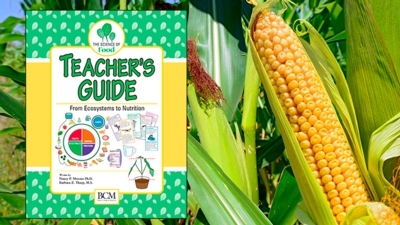 Activity topics include soil and plant growth, photosynthesis, edible plant parts, food webs, digestion, pollutants in some foods, food safety and more! An integrated student storybook is available. Join Dr. Lisa Meffert as she examines the work of Gregor Mendel, father of modern genetics, along with the Law of Segregation of Genes, Law of Independent Assortment, and Law of Dominance. An accompanying teaching slide set is available. Neuroscience lessons, teacher guides, expert presentations and student reading materials for a range of grades. Learn best practices and techniques for using a microscope to study live organisms. Get a head start on STEM with interrelated reading/language arts activities and inquiry-based science explorations. BioEd Online is your source for free, interactive courses on a wide range of key topics, including genetics/genomics, environmental health and the fascinating science of water. Materials are sorted by topic, making it easy to locate the content most appropriate for you. Join Dr. Paul Ling as he discusses a virus that is killing baby elephants, and new treatments which keep the elephants alive. Introduce or review basic physical science concepts with your class with these engaging videos.